Paranormal Pop Culture: ABC series 'Resurrection' an undead treat? ABC series 'Resurrection' an undead treat? After trying to save his aunt from drowning and losing his own life 32 years ago, eight-year-old Jacob (Landon Gimenez) awakens in a rice paddy in rural China, wearing the same "Mansfield Panthers" red sweatshirt that he died in. The only identification he has is his name written on this sweatshirt. Jacob remains speechless until an immigration agent named Marty (Omar Epps) returns him to his hometown of Arcadia, Mo., and he is reunited with his stunned parents. 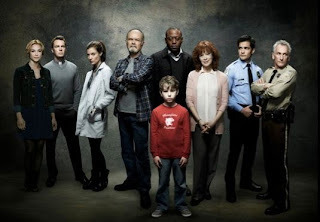 As if the drowning death of their son wasn’t difficult enough for Harold Garland (Kurtwood Smith, aka "Red" from That 70s Show) and his wife, Lucille (Frances Fisher, aka "Eva Thorne" from Eureka), now they must discover the answers to so many impossible questions. After DNA testing reveals that Jacob is their son, the Garlands are faced with not only raising him but also with solving this incomprehensible mystery along with the Sheriff (Matt Craven) whose wife drowned along with Jacob. Why was Jacob chosen to return? How is this even possible and what has allowed this to happen? Watch the trailer and let us know if Resurrection will be on your viewing list. We’ll let you know its premiere date and time when it’s released.